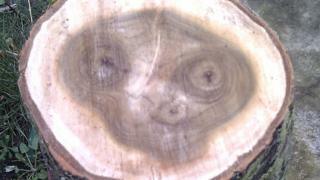 A Wiltshire man had an extra terrestrial encounter when he found the face of the film character ET in a log! 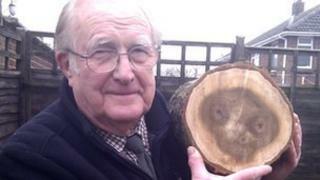 Ken Dobson from Chiseldon said he found the pattern when he was sawing firewood at the weekend. The alien was the star of the popular 1980s film ET, which was directed by Steven Spielberg. Mr Dobson who is a fan of the film said: "As soon as I dusted it off I knew who it was straight away." It won't be thrown on the fire though, Mr Dobson said he would feel bad using the log for firewood! He would like to keep it as a family heirloom if it does not deteriorate. "If it dries out too much it will split," explained Mr Dobson, "but if we can dry it steadily enough, it won't." He wants to have the log professionally cut so he can give sections to his sons.